The White House has dismissed former US President Jimmy Carter as "increasingly irrelevant", following his sharp criticism of President George W Bush. Mr Carter on Saturday said the administration's impact on the world had made it "the worst in history". A White House spokesman responded by saying that Mr Carter had engaged in "reckless personal criticism". Such bitter exchanges are rare between an incumbent US president and one of his predecessors, analysts say. Speaking in an interview with NBC Television on Monday, Mr Carter appeared to back down from his words, saying his remarks were "careless or misinterpreted". The former president said he had been responding to a question comparing the Bush administration's foreign policy with that of Richard Nixon's. "And I think Richard Nixon had a very good and productive foreign policy and my remarks were maybe careless or misinterpreted. But I wasn't comparing the overall administration and I was certainly not talking personally about any president," Mr Carter said. Mr Carter's original comments on President Bush came in an interview with the Arkansas Democrat-Gazette newspaper. "The overt reversal of America's basic values as expressed by previous administrations, including (those of) George HW Bush and Ronald Reagan and Richard Nixon and others, has been the most disturbing to me," Mr Carter said. In response, White House spokesman Tony Fratto on Sunday said: "I think he is proving to be increasingly irrelevant with these kinds of comments." Mr Carter has been an outspoken critic of the Iraq war - but the administration had so far largely refrained from attacking him in return. Correspondents say the response marks a departure from the deference that sitting presidents traditionally have shown their predecessors. 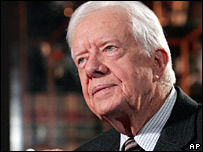 Earlier, in an interview with the BBC, Mr Carter condemned British PM Tony Blair for his "blind" support of the Iraq war. When asked to characterise the close relationship between the US and British leaders, the former Democratic president said: "Abominable, loyal, blind, apparently subservient." Mr Carter was US president from 1977 to 1981. He won the 2002 Nobel Peace Prize for what presenters cited as decades of work towards peace and economic justice.